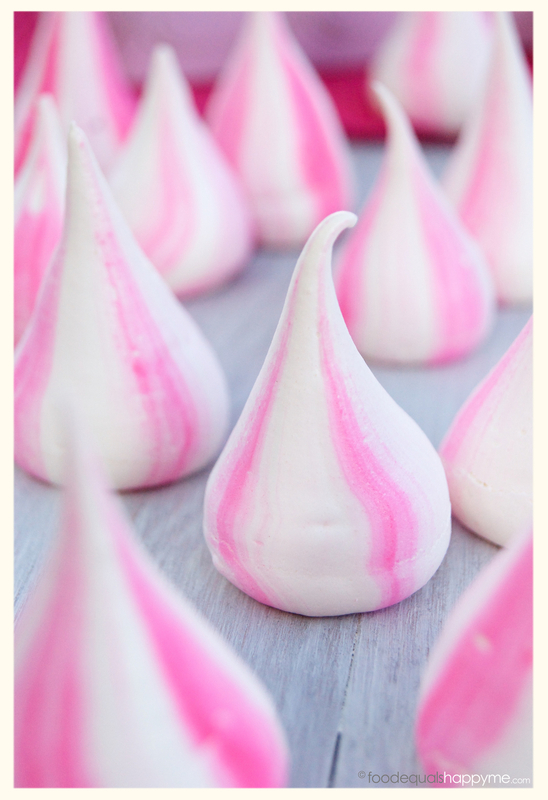 How cute are meringue kisses? I mean seriously, look at them, so cute! These are, for lack of a better phrase, so hot right now. People like the Meringue Girls and Charlie Buckett have made meringue kisses one of the coolest things in the foodie world. Deservedly so in my opinion, they are colourfully cute, bite sized, and full of mallowy goodness. Great for kids party treats, used as decorations on a cake, or just a snack sized treat for anytime. Feeling confident, the plan was then to make something fairly similar to this, but bigger & better. What happened instead was a day of disasters, you know one of those days where nothing just seems to go right. A strawberry cream cheese frosting (and a hot humid day) was my ultimate undoing, and I had cake layers sliding off left right and center. A big fat baking failure that was just getting worse by the minute. A few swears, and quite a few deep breaths later, I salvaged something passable but ultimately I was still very disappointed. So why would I choose to share this with you? Because every cook & home baker out there needs some reassurance every now and again. Reassurance that all of us have disasters in the kitchen sometimes, it just happens. Don’t say to yourself that you can’t cook and give up. Learn, move on, and just keep trying. 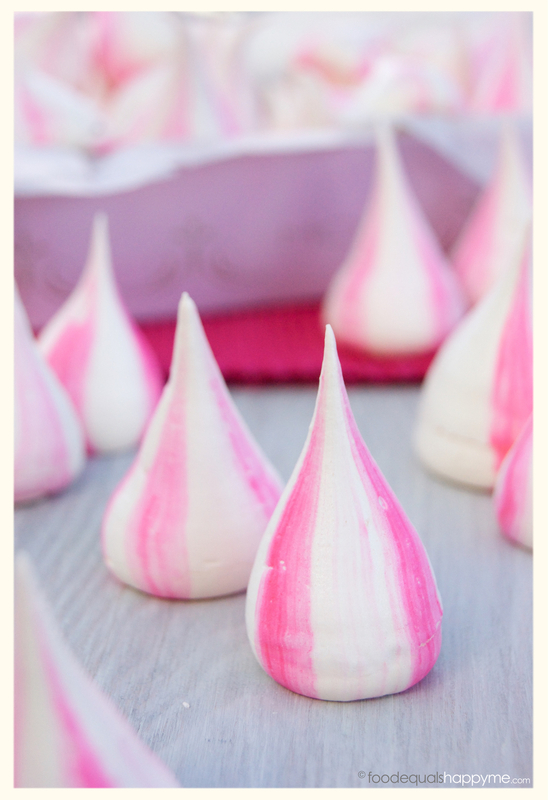 Because when it works you can be rewarded with some really great stuff – like these gorgeous Meringue Kisses. First separate the eggs, and weigh the egg whites. The egg white to sugar ratio is very simple – double sugar to egg whites – so once you know the weight of your egg whites, multiply that by two to determine how much sugar you will need. Next weigh out your sugar, and then place in a baking dish lined with baking paper, and pop in a pre-heated 200 degree c oven for 3-5mins. Keep an eye on it, you want the sugar to get hot but not melted. When you see the edges just starting to melt take it out. Whilst the sugar is in the oven place the egg whites into the bowl of an electric mixer fitted with a whisk attachment. Whisk the egg whites until they form stiff peaks, to test you should be able to turn the bowl upside down without them falling out. By this stage the sugar should be ready to take out the oven. Reduce the oven temperature to 100 degrees c.
With the mixer running on high, add the hot sugar a spoonful at a time, making sure the egg whites beat well after each addition. If you have any crusty bits of sugar from around the edges of the baking tray, discard and don’t use. Once all the sugar is incorporated, continue to whisk for another 5-7mins or until the meringue is stiff, glossy, and when you rub a little between your fingers you don’t feel any sugar granules. Next turn a disposable plastic piping back inside out (leave the small tip unturned so that you can grab it to turn back out). Paint 4-5 stripes of food colouring along the piping bag, about 5 inches long near the tip end of the bag. Carefully turn the bag back the right way, and then fill with the meringue mixture. Snip the end of the bag off (give yourself at least a 1inch opening) and then carefully pipe the meringue kisses onto baking trays lined with baking paper (Before you start piping you can use a little of the meringue mixture under each corner of the baking paper to stick it down, this will keep it from lifting up as you pipe) To pipe the kisses, hold the piping bag vertically and squeeze out a nice round, then as you reduce the pressure on the bag pull upwards in a quick motion to create a nice pointed tip. 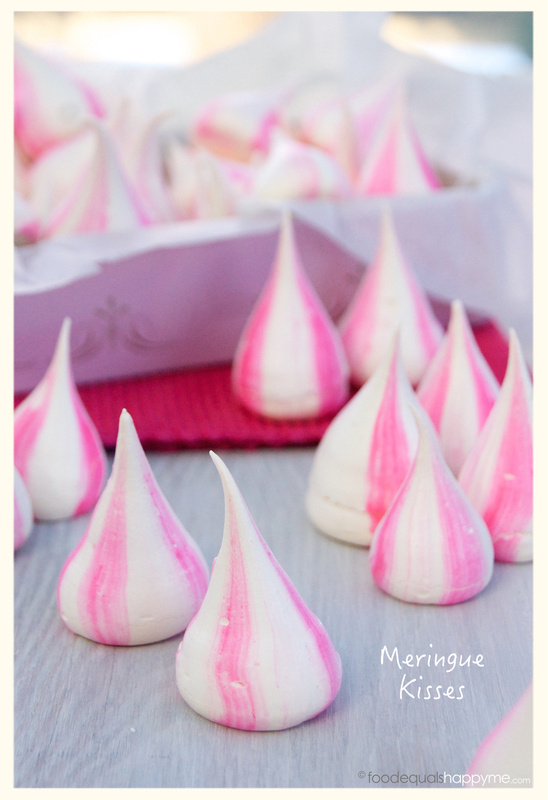 Bake the meringues in the preheated oven at 100 degrees c, for 30-40mins. To test if they are done, carefully lift one off the baking paper, and if it lifts cleanly off the paper then it is ready. These meringue kisses have a crisp outer with a mallowy inside, if you prefer your meringues crispy all the way through you can cook them for longer, around 1-1.5hrs. Stored in a airtight container, they will keep for around 2 weeks, if they last that long! 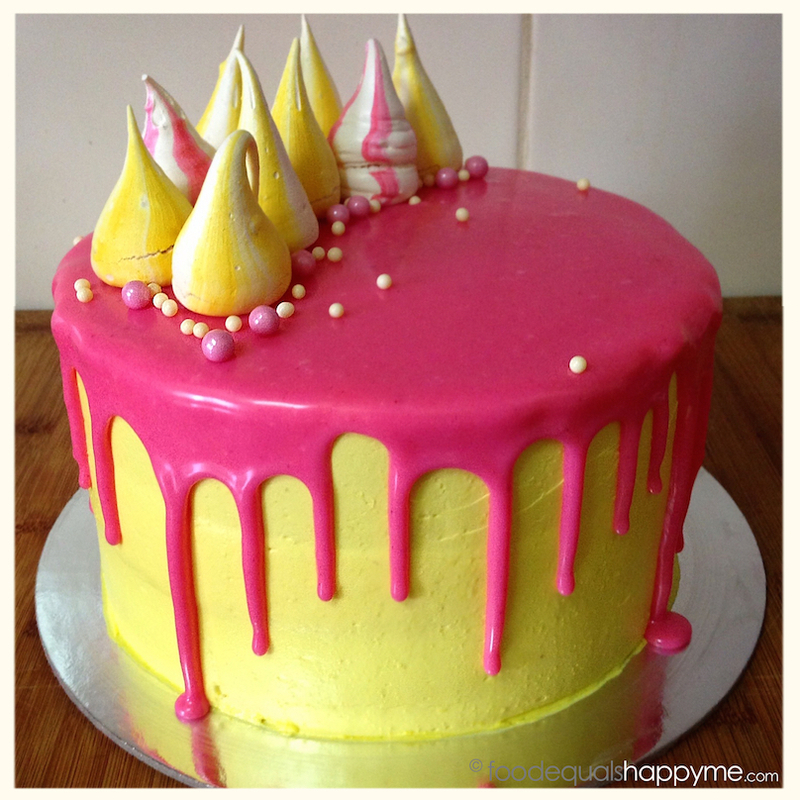 Hi your meringue kisses are adorable and so is the cake, I’m just so sorry for you that the larger version didn’t play ball. I love that you are honest about your baking disasters and disappointments. It’s so easy to portray a pastel world of perfectness, when in reality half the muffins stuck to the pan, or the loaf we’ve baked a hundred times is lop sided!! But you can’t knock those adorable kisses, something I’ve been wanting to make for ages and have now been inspired by you to do, thank you. These are gorgeous by the way! 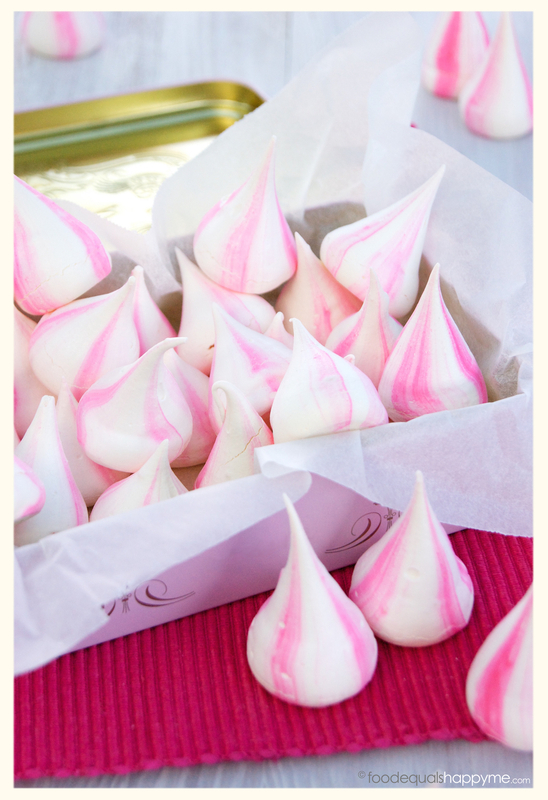 hi..such a beautiful meringues right there! can’t say I have experienced that. A couple watch outs that will affect your meringues is to ensure that your sugar is completely dissolved in the mixture before baking, and make sure that your oven is at the right temperature by using an oven thermometer, hope that helps!